Who Will We Be?JAMA Surgery ! 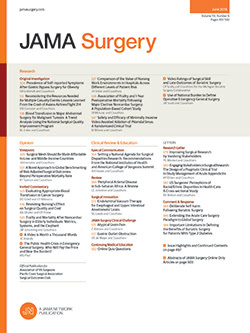 The Archives of Surgery will be officially renamed JAMA Surgery, beginning January 1, 2013; the other 8 Archives journals will be renamed similarly for their specialties. When I discussed this with the new JAMA editor, Howard Bauchner, MD, I was excited about the new name. We are uniquely linked to JAMA and this name change will broadcast that association even more vividly. The Archives of Surgery has increased its impact factor consistently during the past 7 years that I have been editor. This name change will attract even more excellent articles as submissions to our journal. As editor of the Archives of Surgery, I meet with the other Archives editors annually, and we interact with the JAMA staff and editors daily. It makes sense that we should share the same name and brand. The JAMA website will facilitate the interaction with The JAMA Network. There will be a major redesign of The JAMA Network journals in January 2013 as well—the first time in 20 years! The editorial board of the Archives of Surgery will have its annual meeting in July in Montreal, with the host being Gerald Fried, one of our recently added editorial board members. We will discuss our new name change at that time. Until then, please feel free to send me or any of the members of the editorial board your thoughts and comments. This is an exciting time with this new change in our name, which will be fantastic for us all—editors, authors, and readers! Get ready for January 2013! Who are we? JAMA Surgery ! Correspondence: Dr Freischlag, Johns Hopkins Medical Institutions, 720 Rutland Ave, Ross 759, Baltimore, MD 21205 (archsurg@jamanetwork.org).